We received a sad email from Lynne and George Yourick recently. They informed us that Ricky, their beloved greyhound, lost his battle with osteo. Ricky is a dog that Bill and I fostered for a very long time back when we were working for a group that no longer is in business. Ricky came into our house right off the hauler with two other dogs in early 2002. All three came here and got the usual treatment. All were kept outside and brought in one at a time to be bathed and cleaned up. That is because they were all crawling with fleas and were filthy coming straight from the kennels. That was the norm back then. Ricky had terrible flea dermatitis and had open sores and scabs all over him. He was missing a lot of hair. He was so thin. Bill and I remember that day as it was sad to see dogs in such awful condition. Ricky stayed with us for at least a couple of months as that was when the group we were working for started to go downhill and did not do as many meet and greet events or adoptions. Ricky accompanied me on a regular basis to my new part time retirement job working in an antique mall. He loved being there and the customers loved visiting with him. Over the months that he lived with us he filled in nicely and his coat began to shine (in addition to his beautiful eyes). We were worried that Ricky would never find his forever home (he was not cat safe) but figured that, if he didn’t, he could stay with us. But Lynne and George came along and met Ricky and that was it. They fell in love with him and the rest is history. 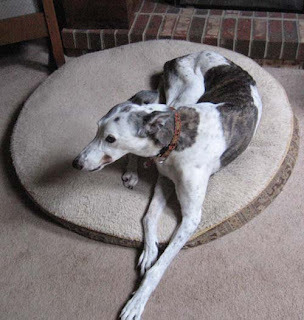 Later Lynne and George adopted another greyhound from our new group (WVs Zagnut) and he recently lost his battle with cancer. Shorty after Zagnut went to the bridge, Ricky was also diagnosed with osteo (in early August). Lynne and George decided to go with pain management because of Ricky’s age. He was twelve in April. We know that Ricky took awhile to find his forever home. But that is because he was waiting for Lynne and George to come along. He could not have gotten a better home. Ricky has always been close to our hearts because he was here with us so long. We share in the grief of his loss. But we are gratified that Ricky had such a good home with two people who truly gave him all that any greyhound should have and deserves. Run free Ricky and know that you were loved greatly.